This past weekend, our Weekly Workshop focused on building a suffocation trap. 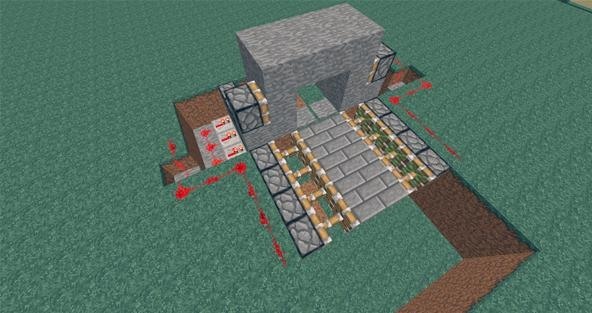 But today, we're going to be covering a different type of redstone trap in Minecraft—one with a 100% success rate (perfect for PvP servers). This is going to be your base before placing anything. It will give you a general idea as to where the pistons, redstone, redstone repeaters, and stone will go. 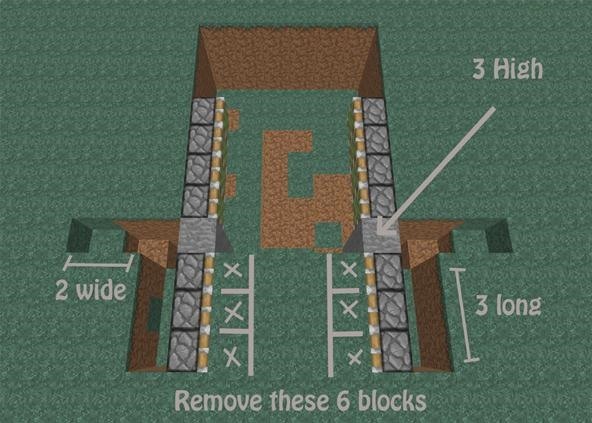 We will use stone blocks in this tutorial to show where the redstone will be placed. Place the 8 sticky pistons exactly as seen below. This will be the inside piston floor (imagine the chest at the back middle). Add the two stone pillars (3 blocks high) just like in the picture below, and add 6 more sticky pistons as shown. 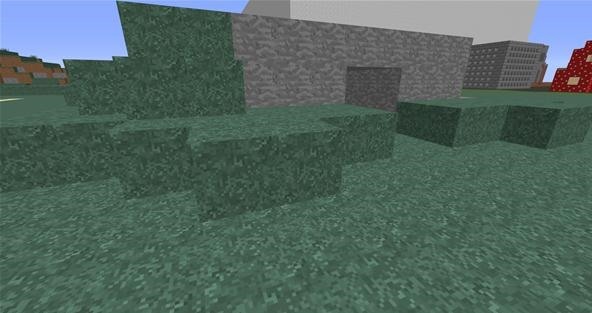 Remove the 6 grass blocks as well, so it doesn't break the pistons later on. 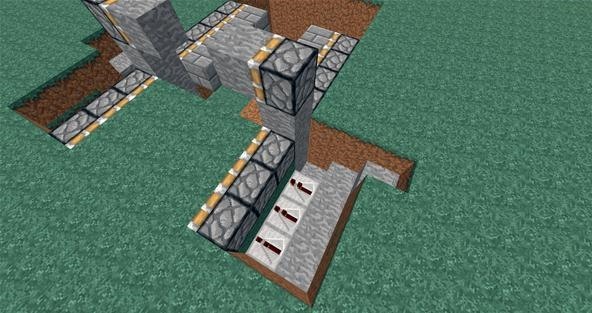 Add 3 redstone repeaters 1 block down from the back of the pistons. Don't change the delay—just leave it! Add sticky pistons facing inward to the path, on top of the stone pillars you just made in Step 2. Place 3 stone blocks directly behind the repeaters, so the stone blocks are equal to the repeaters (as shown at the far left of this screenshot below). Do the exact same thing on the right side as you just did to the left. 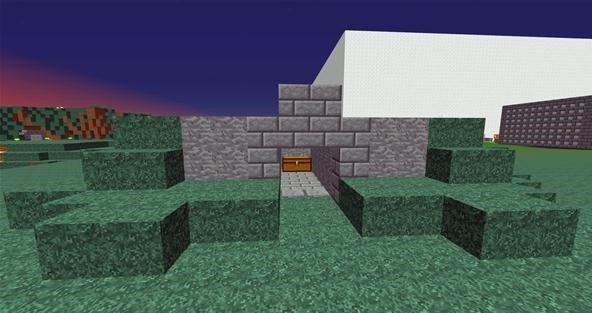 Add the "entrance" just like shown in the picture below. Remember to add the pressure plates directly in front of the sticky pistons on the stone pillars. If you do not place them exactly as I have them, your pressure plates will not work. Add your floor to the sticky pistons in the back. For this tutorial, I used stone bricks. You will only be placing 1 stone brick on each sticky piston for a total of 8 stone bricks. Now you can start adding your redstone. 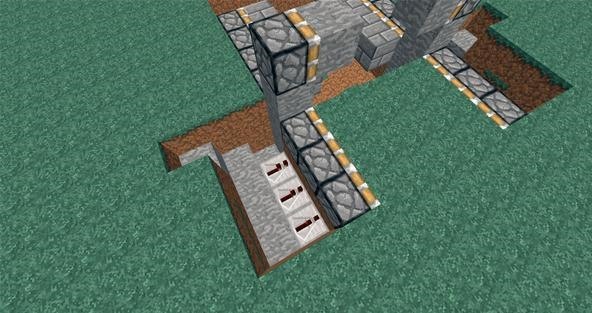 On the "steps" behind the stone pillars, do not add redstone to the bottom step. 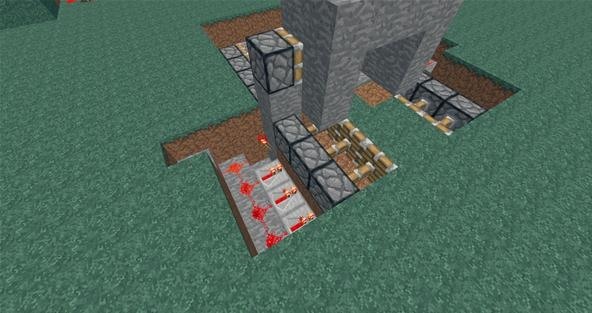 Instead, you will add a redstone torch 1 block up from the bottom step. And as usual, do the exact same thing to the opposite side. You will notice the sticky pistons activating and pushing forward... this is a good thing! 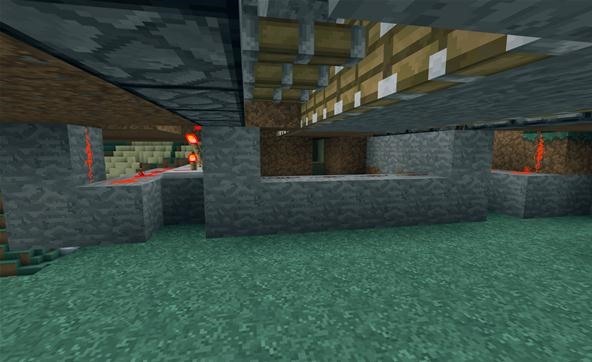 We will now be powering the inside floor sticky pistons by placing redstone and connecting it to the front redstone repeaters. Below, a closer image of how the redstone is to be placed. Don't forget, you need to do this to both sides! You will need to add more stone like I did above, in order to power the top piston. Once you add the 7 extra stones, place a redstone torch behind the sticky piston. 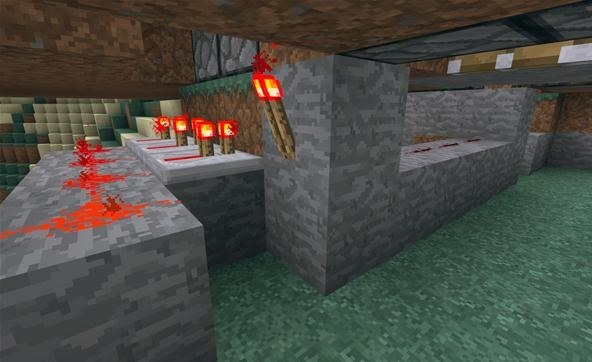 The redstone behind the stone will power this torch once the pressure plate is stepped on. Step 7 Final Step for Redstone! Behind the redstone torch you placed beside the repeaters, you will need to place more stone. Behind the redstone torch and down 1 block, place 4 stone blocks. On top of these 4 stone blocks, place 4 redstone. 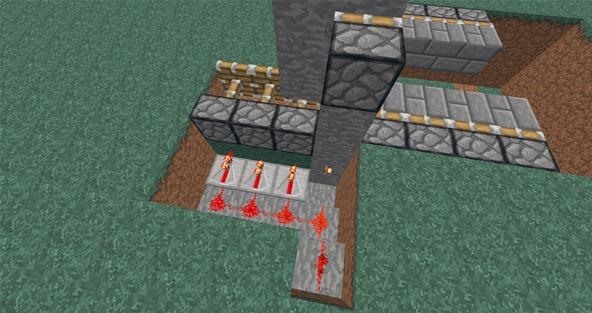 This redstone will connect both sides so that once the pressure plates are activated, both sides will activate. Now, to make your trap less conspicuous. 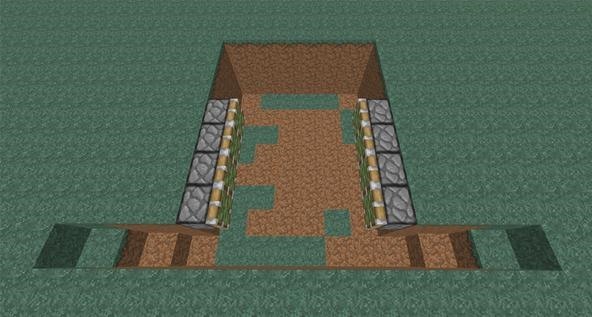 Cover all of the redstone with grass so it looks more like a hill. 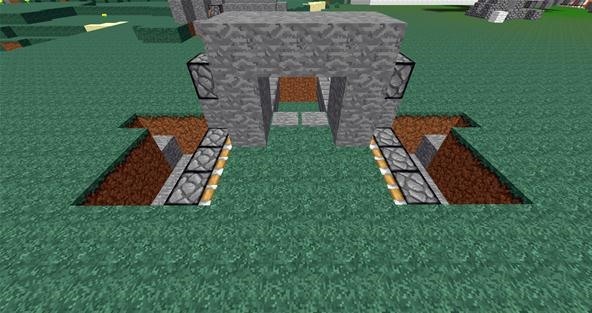 Be sure to make a hollowed out hill so that you don't block any of the redstone! You can go back and replace any of the stone with another block type to fit your design needs. 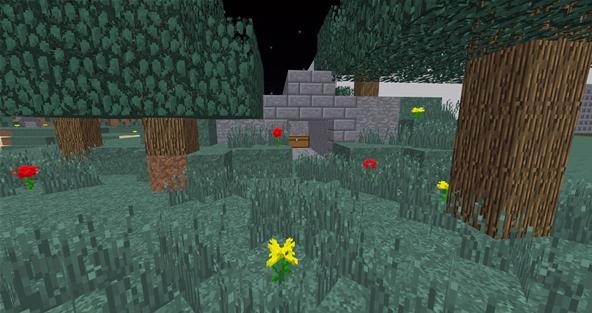 Add trees and tall grass to make it blend together better! Be sure to test out your trap several times, because depending on whether you want to kill the intruders or just trap them, you may need to add more to it! When they fall through the trap, do you want them to die in lava? Do you want them to be trapped in there for good until you return from a night of mining? Do you want them to fall to their death so that you can steal their items after they die? It's up to you—anything is possible! Here's a video of the trap in action. No escape! This trap guarantees your victims demise! The new Weekly Workshop will be be announced on Wednesday, so be sure to check back! If you have a suggestion for this week's Workshop, leave a comment below. We'd love to hear your ideas! 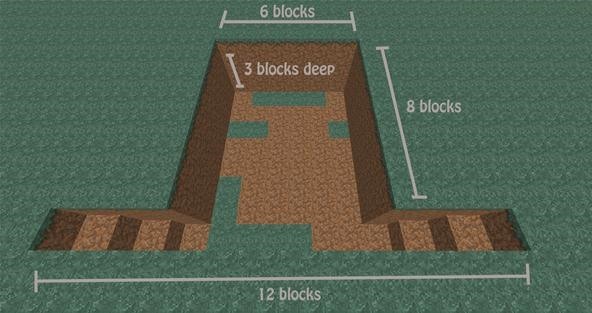 I think that chests activate redstone, so just hook this up with the chests instead of the pressure plates (its too detectable) and you have a almost fool proof trap. other ideas could include a narrow corridor that takes a turn. 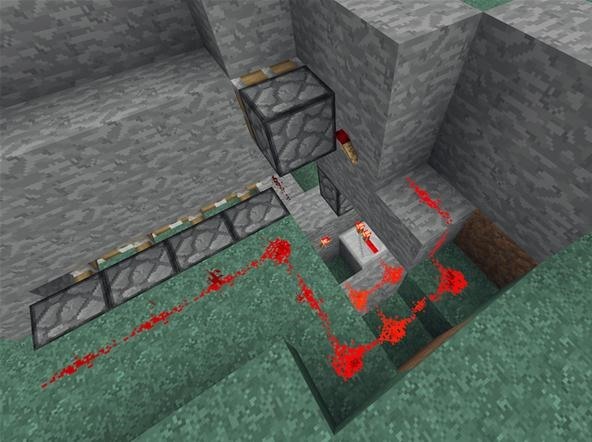 at the outside of the turn, a dispenser spits out a block onto a pressure plate, and that inturn activates pistons. Both of these ideas are more undetectable than mere pressure plates. I don't believe that that would work, but you could definitely pull the "trap furnace" trick here, assuming that it works with chests as well. Unfortunately, chests now are smaller than a normal block, though, so it would be easier to see. Worst written tutorial I have ever read. And you can do better? I would make the victim drop to a mini lava pool full of zombie pigmans.Is that a good idea?